Denver International Airport (DEN) is a major airline hub, the fifth-busiest airport in the United States and 20th-busiest in the world, serving the third most destinations of U.S. airports. Hours: 8 a.m. to 5 p.m., 7 days a week. 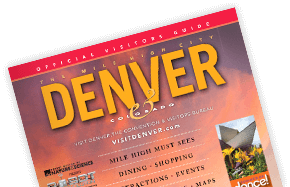 At a cost of $10.50 each way (with several discounts available), travelers can use the new rail service, known as the A Line, from the airport to Denver Union Station and vice versa courtesy of the Regional Transportation District (RTD), metro Denver&apos;s public transit provider.